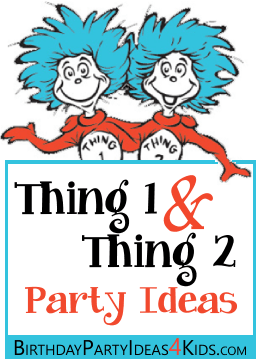 Fun ideas for a Thing 1 and Thing 2 birthday party theme. Great theme for kids of all ages, siblings or twins! Mix and match these fun birthday party ideas for a Thing One and Thing Two party. For these fun games have party guests split up into two teams. For each team make up large white circle stickers that say either "Thing 1" or "Thing 2" and have the teams wear them to show which team they are on. Place a poster or a big drawing of Thing 1 or Thing 2 on the wall. Give each guest a small piece of light blue "hair" made out of construction paper or poster board. Stick tape to backs of each guests "hair" and write their name on it. Blindfold the children and spin them gently around. The party guest who tapes their "hair" nearest to the top of the "Thing's" head wins! Play these tag games with a new twist ... have 2 kids be "it" and call them Thing 1 and Thing 2! Make several bases that players can use to be "safe" for a short time while being chased. The bases can be made out of large red cushions, poster board or red fabric. When tagged by a Thing the players have to freeze. They can't move at all until another player unfreezes them. After the "things" freeze every player they pick the people to be “it”. Instead of 1 child who is "it" choose two children to hold hands and be "double it" ... Thing 1 and Thing 2! They must hold hands during the time they are it and have to try and tag people as a team. Our Dr. Seuss party games page has great ideas to complement the Thing one and thing two party ideas! For more fun party games see our party games page. An easy and fun way to make invitations is to buy blank cards that are red on the outside. Take a small piece of light blue feathery garland (use the downy type feathers) and hot glue it across the top of the card. You can also buy large round labels (at any office supply) and stick 2 of them in the center of the red cards. Hot glue a small piece of the lt. blue feathery down to the top of the circles. 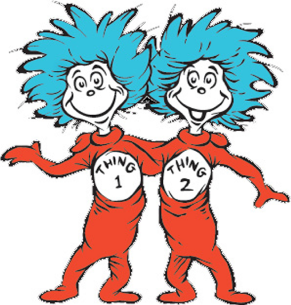 Write (or print on your computer) on the stickers "Thing 1" and "Thing 2". The birthday party theme colors should be light blue, white and red. Use white, red or light blue solid plates. On the party tables and around the room place small glass containers (like small fish bowls) filled with red, white or light blue stones or marbles. In each container place fresh carnations in white and red. Around the top of the glass container hot glue some of the light blue feathery garland. Set out clear glass vases filled with large blue and white feather plumes. Make a quick and easy birthday garland by printing out the letters for "Happy Birthday ____" (child's name) and then use clothespins to pin them to a light blue feather boa. Make a fun bank by covering small containers that have a lid with red felt or scrapbooking paper. Glue on light blue feathery garland around the top of the lid. Have an adult cut a hole in the top of the lid where money can be inserted. Let guests paint wooden picture frames with red paint and then decorate with sparkly gems in white, red and light blue. Hot glue light blue feathers to the top of the frame. Buy red t-shirts and iron on a "Thing 1" or "Thing 2" white patch in the center or let the party guests paint their own with fabric paint. This is a fun way to separate teams for party games - before the party make up shirts for both Thing 1 and Thing 2 and let the party guests decorate with their name. Decorate cupcakes using blue frosting - place in red cupcake holders. Decorate cupcakes with blue cotton candy on top of the frosting. Cookies decorated with white icing and "Thing 1" or "Thing 2" written in blue or red. Small red bags or Chinese take out containers with light blue feathers or trim glued around the top. Red bandana to gather around the party favors - tie the ends together. Paint wooden boxes that have lids red and write "Thing 1 and Thing 2" on the side of the box.